A Slice of Life: My niece is a born artist.. I'm glad your little girl is so creative. 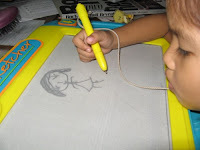 It's wonderful that you encourage her to develop her art skills at an early age! You can easily use this on your computer desktop with photos in it! You simply download the desktop, open the file in a photoediting program, put in your photos behind the original layer (the one with the desktop design) and just move your photos around until they fit. Then you just save as jpg. Hi Te Jen, salamat sa dalaw. Galing naman ng pamangkin mo...talagang mana sayo hehe. I'm pretty sure you're niece will grow up to be an artist like most of you in the family. She has everyone to inspire her. HI Brian thanks for the visit, she is really born with the talent, just this minute i saw her doodling again. Nits, thanks for stopping by also..
HI ANDREA, when an artists runs in the family there's no doubt one will follow suit. I hope your son will develop this skill also. Thanks for stopping by !! I also bought my two-year old son a mega sketcher - just like in the picture. He also loves to draw.